The photograph Bichonnade, 40, Rue Cortambert, Paris (1905) (above) is perplexing. It looks like the photographer has asked a complicatedly-dressed young woman to jump off of the stairs for a picture. And it's not just a couple of stairs, it's like six or seven, and in the picture the woman looks like she is flying. At the turn of the 20th century, when photography was still a highly exclusive activity, left to professional practitioners and serious amateurs, who would have taken a picture like this? 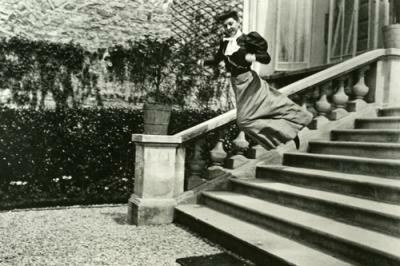 The answer is a curious, pre-pubescent, affluent boy named Jacques Henri Lartigue. In a time when not many eleven-year-olds had access to photography, Lartigue's pictures stand out in the history of photography for their precociousness and their desire to make the world float. The Caixia Forum in Madrid is currently showcasing a retrospective of Lartigue called Un Mundo Flotante or A Floating World which is runs through June 19. Lartigue's photographs in this exhibition are from almost every stage stage of his life. 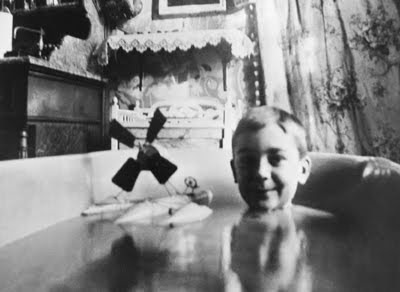 From his infamous childhood self-portrait in the bathtub (assisted by his nanny) to late life photographs of his own shadow, Lartigue was the ultimate photo-enthusiast, and he followed the many technological changes--both photographically and otherwise--that were taking place in the world through the context of his own, charmed life. Lartigue's life, as it seems, was one of non-stop leisure. The subjects of his photographs are auto races, tennis matches, beautiful women, early airplanes, his well-to-do family and himself. His technique matured as he became a young man and he experimented with different types of processes such as stereo-photography and color photography in the form of early autochromes. What stayed consistent throughout his life however, was the existence of lightness and joy in his pictures.